Jermaine Samuels of Villanova goes up for a breakaway dunk against St. Mary's. HARTFORD, Conn. — For its first NCAA Tournament game as the defending national champion, Villanova had to deal Thursday night with playing at the snail’s pace preferred by St. Mary’s, a tempo that led the Gaels to an upset victory over top-ranked Gonzaga a little more than a week earlier. But the Wildcats performed the slow dance well enough behind the play of their two senior leaders. Phil Booth scored 20 points and added six assists, and Eric Paschall contributed 14 points to lift the Wildcats to a 61-57 victory over St. Mary’s at XL Center. The Wildcats (26-9), a No. 6 seed, will meet No. 3 Purdue in Saturday’s second round at 8:40 p.m. The Boilermakers (24-9) defeated Old Dominion, 61-48, in Thursday night’s final first-round game. The pace required the Wildcats to play 30 seconds of defense on almost every possession. Offensively, they weren’t able to shoot the three-point shot as much as they’re accustomed to. Their 20 attempts were their third-lowest of the season but they sank eight. Booth, who played in a program-record 147th career game, did not attempt a three in the first half. He was 1 of 2 for the game, with the “1” being a bank shot from the top of the key. Villanova coach Jay Wright said he didn’t feel as if trying to speed up the Gaels (22-12) would be successful. “The tempo was excruciating,” he said. “It’s much harder to speed up a game than it is to slow down a game. We felt like they’re such a good passing team, so skilled, that if we tried to speed it up, it was just going to give them too many open shots. The Wildcats took the lead for good in the game thanks to a 12-3 run in the opening 3 ½ minutes of the second half that turned a 30-28 halftime deficit into a 40-33 lead. With the Gaels making just four of their first 15 shots in the period, the Cats inched their margin up to eight, 50-42, on Paschall’s three with 7 minutes, 43 seconds remaining. St. Mary’s followed with five straight points to make it a three-point game, but would get no closer. 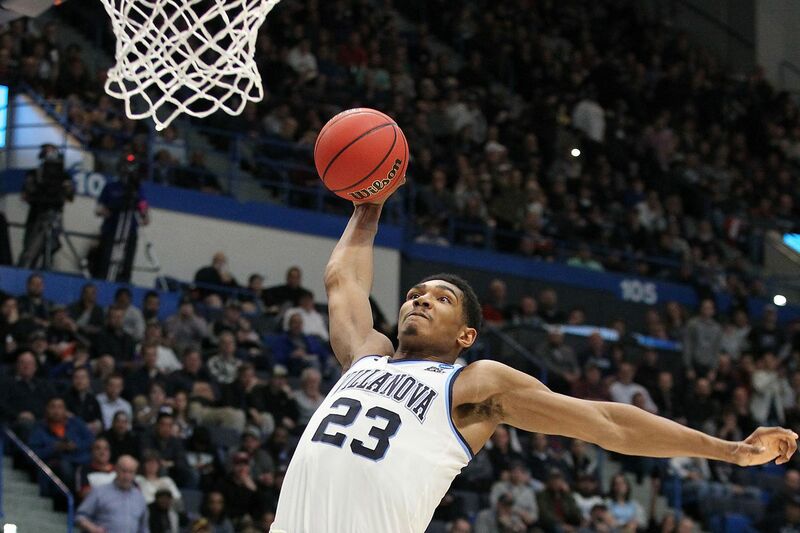 Still, Villanova had some scary moments after a dunk by Jermaine Samuels (12 points, 7 rebounds) with one minute to play restored the eight-point margin at 61-53. Paschal missed the front end of a pair of one-and-ones. The Gaels got baskets from Jordan Ford and Malik Fitts (13 points each) to reduce the deficit to four. The Wildcats didn’t score again but neither did their opponent, as Fitts missed a three-point attempt and Ford turned it over. Luckily for the Wildcats, they had plenty of experience all season with grinding out games. Their last two contests in the Big East Tournament — an overtime win over Xavier in the semifinals, a two-point win over Seton Hall for the championship — were prime examples.